New System Boilers Installed in the Peterborough area. Much like a conventional boiler, a system boiler operates using stored hot water. However, there are important differences between the two. 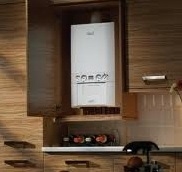 A system boiler contains many major components of the heating and hot water system already built in. This allows installation that is not only faster, but easier, tidier and more efficient. Unlike a regular boiler, a system boiler pumps the hot water straight through the heating system to the radiators and hot water cylinder, reducing the amount of time it takes for the dwelling to heat up and as such, reducing running costs. They are connected to a storage cylinder to provide hot water. There is no need for a feed and expansion cistern with a system boiler. Here are two recommended system boilers from Ideal & Glowworm. High efficiency Logic System & Logic+ System system boilers combine the highest standard of British engineering with contemporary styling and intelligent design. Trusted by installers and homeowners throughout the UK, the Ideal range includes a number of SEDBUK band ‘A’ rated models that are fully approved by the Energy Savings Trust. 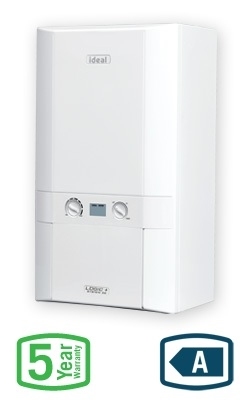 Click here to go to the manufacturers website for the Logic System Boiler range. SEDBUK A rated and easy to install, the Logic System range of appliances from Ideal provide a simple and reliable solution for a wide variety of sealed domestic systems. Available in a choice of four outputs – 15, 18, 24 and 30kW, the Logic System provides a dependable and efficient solution for new and replacement installations alike. 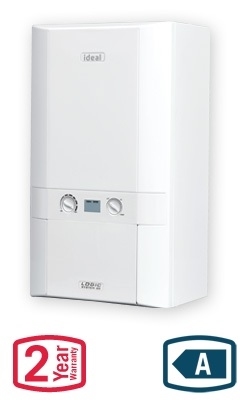 Complete with a 2 year parts and labour warranty* and with additional extended warranty options available, the Logic System boiler provides simple heating control, all from a single compact appliance. The Logic+ System range of appliances from Ideal provide a reliable sealed system solution, complete with a 5 year parts and labour warranty* for the ultimate in home comfort and total piece of mind. Product design and quality is paramount within the Logic+ System range; additional features such as plated internal pipe work, spare fuses and a PRV wall outlet pipe all ensure total reliability and a hassle free installation. Siting and installing a Logic+ System is straightforward when a simple telescopic flue is used, complete with push & clip flue turret connections. Alternative fluing options available. Glowworm Ultracom2 sxi System Boiler. New High Efficiency system boiler range with a choice of flexible control options available in 12, 18 & 30 kW outputs. The advanced stainless steel heat exchanger reduces noise so much, it is so quiet you’ll barely know it’s there. With a choice of plug in digital timer or external controls the Ultracom₂sxi offers complete flexibility providing perfect home comfort for every application. Also featuring a unique receiver slot located inside the boiler, the Ultracom₂sxi and the new Climapro₂RF wireless programmable room thermostat are the perfect combination for advanced heating control. glowworm have not created a site in the homeowner section, as yet. Please click here for a marketing press release from glowworm since this new boiler range is so new. Call for new system boiler installations in the Peterborough & Cambridgeshire area. when fitting a system boiler.